As a marketer you want to take on the world. Everything you touch is your baby and letting go of even just the smallest part can feel hard. But if you truly want to grow your business rapidly, then you need to take advantage of outsourcing and once you are armed with the best virtual assistant tools it’s easy to build an awesome virtual team. That means you can spend less time working in your business and more time working on your business. What Are The Best Virtual Assistant Tools? Freelancer is one of the giants in the Freelance Outsourcing world. Prices can be a little expensive here, but then – at the risk of upsetting a bunch of people – the quality of the work tends to be of a much higher standard too. Freelancer tends to be the place that established outsourcers move to once they have found their feet on cheaper platforms like UpWork (which we will look at in more detail below). So if you are looking for high quality no fuss virtual assistant to work with, this is the place for you. The downside to the tool is that you kind of have to post a job straight away and can’t take a look around. Although, if you aren’t bound to anything, so it can’t hurt. You can also drill down into their profiles further and look at feedback from previous jobs to get a feel for them. UpWork used to be Elance and oDesk but they combined to become an outsourcing supergiant. Which has made life a lot easier for you, because everyone using the tool is in one easy to find place. 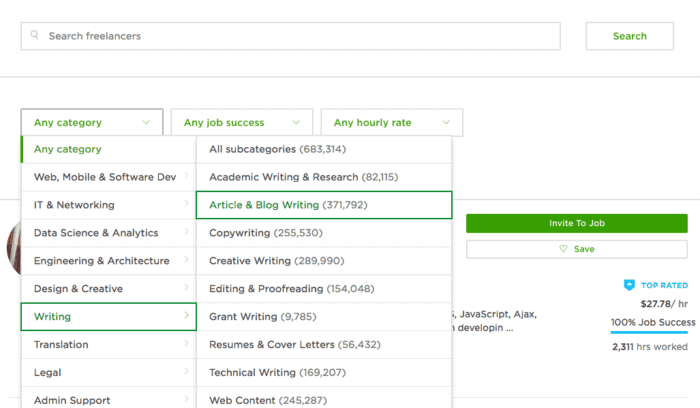 The interface is simple and, because UpWork is one of the first places that people go to set up to work online, you can often grab yourself a better deal on price, but that also leads to a generally lower quality of worker. So no matter what it is that you need to offload and outsource you can find it here. Or you can go ahead and create a job listing that people can apply for. They even have a guide on how to create a good job posting right here for you to follow, if this is your first time. Depending on the type of job the amount you’ll pay ranges. But, for a good quality, native English freelancer, you’re going to be paying between $20 and $40 on average. The topic about making money on Fiverr has been one of the most popular posts on the blog. And, with good reason, because it’s an awesome platform. If you’ve been living under a rock and don’t know what it is, it’s where you can hire someone to take care of a task – from web design to creating PDF’s and getting someone to dance in a hotdog suit to your favourite song for two minutes – all starting at $5. Instead of how working with a Freelancer, which can be more consistent and long term and often require more communication (wanted by both sides, sometimes) this is more of a quick-hit, get it done, policy. You can find yourself saving a lot of money using this platform, too. Ryan Stewart of Site Point uses Fiverr to save over $6,642 per month on Freelancers and other costs. If you have a super-specific job to be done, like creating a logo or recording a voice over to one of your YouTube videos, this is one of the best virtual assistant tools to spend your money with. Mobiteam is the go to service to solve any WordPress problem for two reasons. Firstly Mobiteam will complete an unlimited number of 30 minute custom development jobs for your site. They will debug and fix just about anything, it’s like having a full time developer on call. Secondly they also take care of all of your site maintenance, backups, updates and provide live chat for instant support. No matter what happens, they will be there to catch you when you fall. Okay, this isn’t really an tool. But, it’s definitely a weapon you need to have in your arsenal and it’s a tool all of its own. This simple job board is the place to connect with mid-level bloggers who want to write for you. This is paid work for them, however, it’s where you’re going to find some tried-and-true content marketers to write for you. You can post a job here for $70 for 30 days and you’ll get some top quality writers from here once you sift through all of the emails. For example, and not to blow my own trumpet, but myself and a lot of the other top internet marketers hang out here. I’ve found companies and sites like: Ahrefs, MindValley, Nichehacks and Lifehack all posting there (and that’s just off the top of my head), so if it’s good enough for them, the writers must be doing something right. Put a job up and you’ll find yourself with an abundance of good quality writers to choose from. Whether you are outsourcing content, promotion or social media management then CoSchedule will be a life saver. It makes it easy to create tasks and templates that you can assign to anyone in your virtual team – whether you want someone to setup your social queue or contact everyone featured in the post. It comes with a handy WordPress plugin and calendar overview that all syncs together to provide a comprehensive task list based on when your posts go out. Not only does this cut down on the amount of time to manage everything, it also means everyone is on the same page. So if you are trying to manage a blog along with a team of virtual assistants, you can’t go wrong with CoSchedule. It really is one of the best virtual assistant tools on the planet for bloggers. Students want to gain experience and you don’t want to pay top dollar to outsource. So, why not look for students on LinkedIn who you can hire for less money and still get the good quality? Now, once you see someone you like, like Lettie Broom, you can go ahead and click the green similar button underneath. Just go ahead and drop them a message and see if you can work out a deal with them. SuperTasker runs a little like Fiverr in the way that it’s focused on super-specific tasks. They focus on getting jobs turned around by their professionals in as little as one hour. Meaning that you can be sure your work is done even on a tight schedule. All you have to do is enter the broad term for your task – like the below search for Graphics – and it’ll show you all the possible jobs that are available and at what price and time frame. The prices are higher but for the tight time frame you’re always going to pay a premium. And, their customer service seems to be on the ball, which is a bonus. Once you’ve outsourced your work you’ll need a way to communicate and manage what’s going on. Which is where Basecamp comes in. You won’t need this if you’re just outsourcing a Logo design, but if you’ve taken on a bigger project – like bringing in a Virtual Assistant or creating a sales team – you’ll need a place that keeps everything, and the ins and out of the project, all in one neat place. I’m a big fan of Basecamp – especially having used it on both sides of the coin – and if you can swing the $99 a month for it it’s definitely worth it. Another tool to add to your VA arsenal is Acquire. They take communication with clients, colleagues and customers to the next level. They have a range of features available, such as…. The Live Chat function enables you to talk directly to your audience and you can send one-to-one or group based messages. Your customers/clients can continue previous conversations without getting frustrated at having to repeat themselves and multiple team members can be included in the chat. Co-browsing allows you to see what your customers are seeing in able to support them solve any issues quickly and efficiently. Add a new team member to your team with Acquire’s Chatbot. You can train the Chatbot to answer all the common queries that your customers may have and it’ll work to convert visitors into qualified customers and send them to the appropriate human sales representative. Voice and video calls are a great way to interact with your customers. Offering them a personal experience where they can forget having to contact call centres, is a great engagement tool. All calls are recorded and stored and it’s compatible with desktops and mobiles with a one click activation making the process seamless and easy. Profile management allows you to keep track of each customers journey, react quickly and build lasting relationships. Whether you are managing multiple clients, growing your own business or marketing an ecommerce store, Acquire has a bunch of products that will take your communication levels from zero to hero. So if you want to deliver a better all round experience then take advantage of the 14 day free trial and get started with Acquire today! Become more productive and hire your own virtual assistant now! If you want work done to a high standard, then Freelancer is the place to get that. Sure you can find cheaper virtual assistants – but with outsourcing you tend to get what you pay for. Jobs are easy to post and you’ll no doubt be inundated with responses. Making it easier for you to feel more comfortable in the person you choose. There are absolute gems of workers on here, so if you take your time and be thorough, you can get a great deal. If you need a writer – despite being a writer that started his career there – I’d suggest not using UpWork and go straight to ProBlogger. You will pay more here, but as I said above, if you take some time to sift through and find the quality, you can find yourself a top quality blogger. Usually with a good level of experience. If you are working on a blog and need to co-ordinate content production, promotion & social media then CoSchedule will take all of the hard work out of it for you. It makes it easy to manage all aspects of content production from drafting ideas to making sure all of the graphic are ready when you need them. Plus it’s super affordable and they are always adding new features to make your life easier. If you are working on a larger project with your virtual assistant then you will want to co-ordinate everything with Basecamp. It’s so easy to set up and use. Trust me when I say it will save you huge amounts of time & head aches in the long run as you work to achieve your goal. Plus, your first Basecamp is free. Trial it and see how it works for you. You’ve got nothing to lose. The first line hit me like a brick. Whether the vertical is marketing or not, it’s difficult for entrepreneurs to delegate any tasks. Even the tasks you hate or know are weaknesses. It’s the entrepreneur’s ego. The issue is handing out a level of perceived ownership. Beyond just limiting growth by not outsourcing tasks, you burn yourself out. Great post, hope everything is well. That is very true indeed and often hard to overcome! That is very true indeed and often hard to overcome! These tools are really very best for business. Yeah they make life a lot easier! Just a note to update. Basecamp have went from 29 per month to 99 – a decent jump and will cause more people to look around. Wow that is a huge jump!!! I come from an non internet sales organization builder background and my blueprint was to find people with the best skills at each skill to delegate to, so your virtual assistant tools are perfect for my management style. I can control the big picture and outsource all of the details. Perfect! I have a decision to decide over whether to brand this as my name or use domains like Doneforyouim.com, JVZoospecials.com, Innercircleofsuccess.com, and similar names which all come together under one roof. Any Thoughts? This WPmatic sounds really interesting. I am always looking for someone to speed up our website. Thanks for the info.